Where do I use my Lights.co.uk voucher code? Light fittings and lamps can completely change the appearance of a room with the power to make your rooms feel bigger or smaller and the ability to set the mood and ambience to your liking. To ensure each room in your house is equipped with show-stopping lights look no further than Lights.co.uk. Here you can find indoor and outdoor lights, smart home lighting, light bulbs, LED lighting, seasonal lighting and much more, all for great affordable prices. Shop for ceiling lights, pendant lighting, chandeliers, wall lights, floor lamps, cable lighting, recessed spotlights, solar lights, pond lights, fairy lights and more from huge names like Astro, Axo Light, B-Leuchten and By Rydens. The right lighting can increase your feeling of well-being and the latest lamps and light bulbs can help save you energy and money too. High-quality LED lamps, for example, can save you up to 90% in electricity costs and are just as bright as traditional light bulbs. And, as energy savings mean lower CO2 emissions, you’re also helping the environment at the same time as saving money. Lighting has many purposes in your garden. It can be used for decorative purposes, for safety and security, and to create a more comfortable, enjoyable space that can be appreciated from dawn to dusk, no matter how dark it may be. In the outdoor lighting collection at Lights.co.uk you can find all kinds of lighting that fit all these needs and requirements. The range includes wall lights, path and bollard lights, pole lights, spotlights, pillar lights, recessed floor lights, ceiling lights, solar lights, design lights, terrace and patio lights, pendant lights, pond lights, hybrid system sun connect lights and lighting accessories. All these products also come in a range of different types and materials with traditional and contemporary styles, LED options, stainless steel fittings and country/rustic fittings available, not to mention fittings that come with motion sensors for added security and peace of mind. Christmas wouldn’t feel the same without the twinkling, festive lights that glow merry and bright throughout homes around the world. However, finding lights that actually last the course of December without breaking each year can be hard, Lights.co.uk understand this which is why they provide top quality Christmas lights, at impressive low-cost prices. Shop online for your Christmas lights and discover fairy lights, rope lights, LED candles, window decoration lights, LED candle arches, Christmas stars, Christmas trees, curtain lights, Christmas decorations and replacement lamps that’ll not only last this year, but for many more years to come. Shop by colour, type, length, width and price and find your ideal Christmas lighting that matches your festive decor perfectly. How can I contact Lights.co.uk? To contact Lights.co.uk please call 020 3514 3658. You have 30 days from the date of receiving your order to return it to Lights.co.uk. Lights.co.uk are unable to provide catalogues covering their complete range as, by the time a catalogue has been printed and distributed, many items in it may be sold out. Lights.co.uk boast a selection of up to 30,000 lights, lamps and bulbs for your home, office and garden. With indoor and outdoor lights from huge brands like AEG, Anta, Artemide, Bega, Bopp, Cini & Nils Elstead Lighting and Casablanca, you can rely on lights.co.uk to supply you with high-quality light fittings and fixtures that’ll brighten up your home. 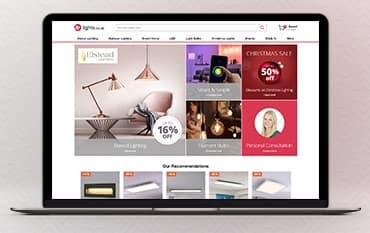 Shop online at Lights.co.uk and use a discount code from us to enjoy huge savings on your order, you can also receive up to 50% off in the sale and enjoy great deals on seasonal lighting and accessories too.